In Oxford, Alabama something awful is happening. A hill, on top of which lies a Native American rock mound, is being destroyed in order to procure fill-dirt for a new Sam’s Club a few miles away. The rocks were arranged on the 200 foot (60 meter) rise over a millennium ago. The site was fundamental in Indigenous rituals and gatherings in the area. According to Oxford head racist, mayor Leon Smith, the site is the “ugliest old hill in the world.” “Just a pile of old rocks,” he added about the mound. City officials plan to in the future remove the top of the hill, including the rock mound, to create an elevated, eight acre (3.25 hec) commercial development site that will overlook the Choccolocco Valley and city of Oxford. 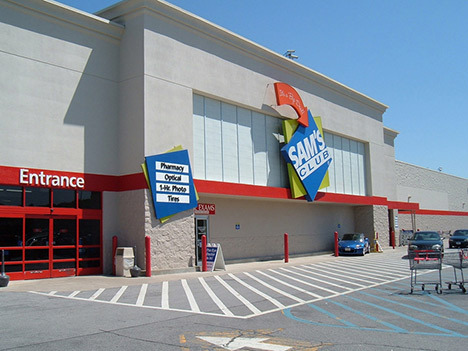 Sam’s Club, a division of Walmart Stores Inc, which is carving into the hill right now, is a growing chain of wholesale megastores. Like Walmart, Sam’s Club markets itself as increasing the purchasing power of First World consumers through low prices. Oxford, Alabama is one locality in an entirely stolen continent. Since 1492, all ‘development’ in Amerika has occurred hand in glove with the protracted genocide of Indigenous peoples. This genocide continues today. Those few Native Americans left which still have ties to the land are finding their historic claims increasing threatened by the federal and state governments and private interests. In the realm of ideas, Native identity and culture continue to be wiped out by Amerika. In Denver and elsewhere, the Sons of Italy and other racists conduct Kolumbus Day parades: celebrations of their 500 year conquest and occupation of the North American continent. Now in Oxford, Alabama, a clearly sacred site of an all but exterminated people is being destroyed with the intentions of creating more shopping opportunities at discount prices for Amerikans. More significant is the connection between Amerika’s founding genocide and the system which fuels today’s consumerism: imperialism. It was in fact Amerika’s genocidal occupation of North America which provided a social, cultural and material launching pad for U.S. aggression abroad. It is no coincidence that during the 1890’s, after the ‘closing of the frontier,’ Amerika initiated a war with Spain and acquired through military occupations the colonies of Puerto Rico, the Philippines and Guam. Today this system is still in place and the U.S. virtually occupies the world. And it is precisely this history of aggression towards the Third World– and the resulting militarily imposed exploitation upon Third World peoples– which compels Sam’s Club and Walmart to bring ultra-low prices to ever more First World consumers, even at the cost of a clearly significant site for Native Americans. While the outgoing scarification of the hill will likely continue, because of the extreme cultural chauvinism at a time when Amerika is attempting to re-invent itself as multi-cultural and pluralistic, the removal of the actual rock mound may be halted through effective campaigning at the reformist level. However, the real solution to this problem is nothing short of revolution. That is because the destruction of the site has a deeper cause than simple racism or cultural chauvinism. Consumer culture, rapid environment degradation, continued annihilation of Indigenous heritage, wars of aggression and systemic Third World poverty are all connected through capitalist-imperialism. Those who want to truly end Amerika’s continued genocide against Indigenous peoples and culture, as well as those who oppose consumerism, poverty and ecocide, should single out First World imperialism as the principal enemy in their related struggles. Those who truly want to create a new, better world must unite with and promote the struggle of the world’s exploited and oppressed majority against the capitalist-imperialist system.